Broil bell peppers with tops about 5 inches from heat, turning occasionally, until skin is blistered and evenly browned. Place peppers in a plastic bag and close tightly. Let stand 20 minutes. Remove skin, stems, seeds and membranes from peppers. Cut peppers into 1/4-inch strips. 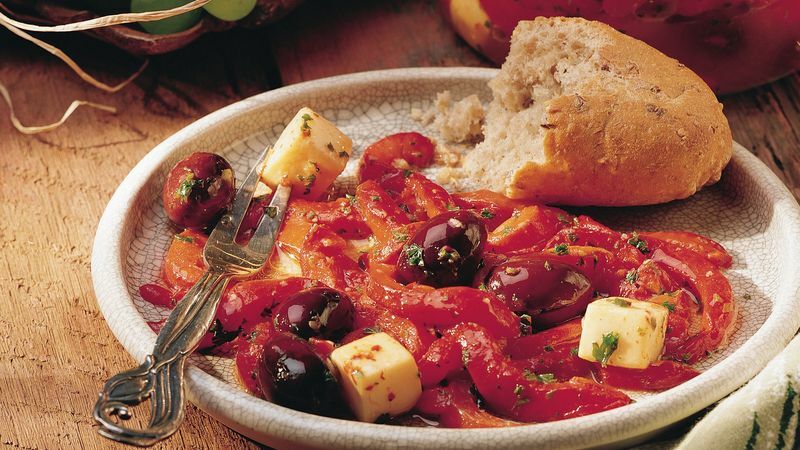 Place peppers, olives and cheese in glass bowl or jar. Shake remaining ingredients in tightly covered container; pour over pepper mixture. Cover and refrigerate at least 4 hours to blend flavors, stirring occasionally. Store tightly covered in refrigerator up to 2 weeks. Turn this recipe into a scrumptious gift by filling a decorative glass jar with the roasted pepper mixture and tying with a pretty ribbon. Attach a copy of the recipe with a sprig of fresh herbs. Roll this veggie mixture up in a warm flour tortilla for Roasted Pepper, Olive and Cheese Wrap. Include a lettuce leaf for a bit of crunch and extra color. Make this appetizer extra elegant by pouring the mixture into a pretty glass bowl and setting a supply of decorative plastic or wooden toothpicks alongside. Use both red and green bell peppers for lots of color!